St. Petersburg College can train you for a long-term Information Technology career. With degrees and certificates in computer programming, cybersecurity, computer networking, web development and technology management, St. Petersburg College offers degrees that prepare you for the best technology jobs. Here is where you'll find the right program to jumpstart or advance your career. Employers love how well we prepare our technology program graduates. Nearly all the companies we asked, 97% of them, would hire another SPC graduate, who they say bring a passion for technology and a thirst to continue learning to their businesses. As part of the networking, security and programming programs you take at SPC, your exam certifications fees in networking, programming and security may be covered. These include Cisco, Java, Linux, Microsoft and CompTIA certifications. If you're currently certified in an IT area, you may qualify to receive up to 15 academic credits towards certain A.S. degrees at SPC. St. Petersburg College offers affordable IT programs that prepare you for technology careers in demand - jobs like systems analyst, software developer and web developer - that rank in the top 20 best jobs by U.S. News and World Report. Stay on track to your bachelor's degree in technology with the Tampa Bay Bridge to the Baccalaureate Program, ready to assist SPC students who want to pursue degrees in STEM fields. "I enjoy the creative process of taking an original idea and turning it into a working, useful computer program. It’s all about getting in there and hooking things together and making them work. I especially like to get students excited about the same thing." 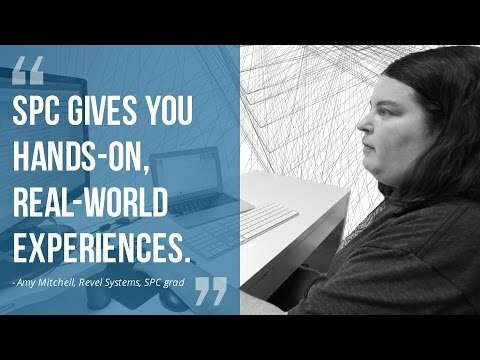 A St. Petersburg College internship gave Amy Mitchell the real-world job skills and connections she needed to make a career change from working as a chef to a new job in technology with Revel Systems. "Faculty members really guide your experience and make sure you're getting the hands-on, real-world experience you need in order to move on in your career." Training the Tampa Bay workforce for jobs in the nation’s second-fastest growing technology hub will get a boost thanks to a $250,000 grant from JPMorgan Chase. Through the grant, St. Petersburg College will partner with the Tampa Bay Technology Forum (TBTF) to serve 125 students and 100 employers the first year. I like the flexibility that St. Petersburg College's online courses provide. St. Petersburg College is always looking for ways to close the talent skills gap in the Tampa Bay area. An SPC education aligns very well with Vology. Students can learn very specific job skills and that serves them well. SPC's iLab has been working with 3D printing technologies since 2014, and is putting that technology to work saving the college money.